The Laughing gull (Leucophaeus atricilla Linneus 1758) is a bird belonging to the order of the Charadriiforms (Charadriiformes), to the family of the Larids (Laridae), genus Leucophaeus, species Leucophaeus atricilla. The name of the genus Leucophaeus is a Latinized term and comes from the old Greek “leukophaés” (λευκοφαής) which means white or from the adjective “leukóphaios” (λευκóφαιος) which means grey-white / greyish. 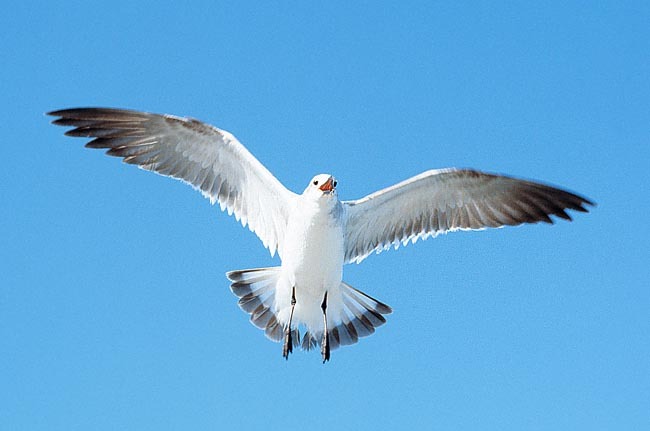 Both these adjectives are composed by “leukos” (white) and “phaos” (light) and refer to the livery of the gull. The epithet “atricilla”, indicating the species, comes from “ater” = black and with the suffix “-illa”, that is, greyish with reference to the colour of the upper parts of the trunk of this species. 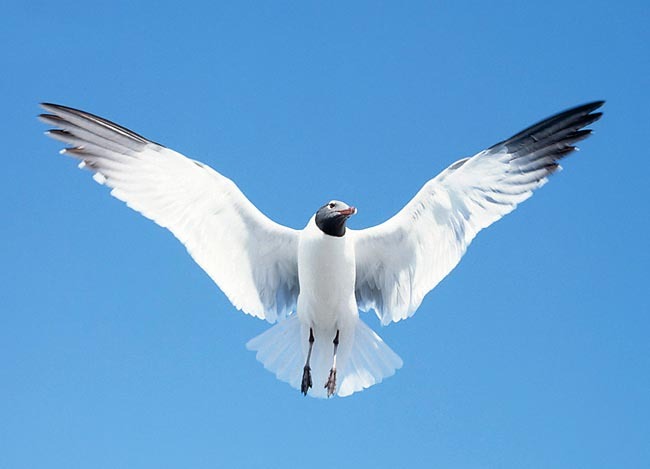 The common name of laughing gull refers to the harsh call it emits, “kee-agh”, and which has the sonority of a harsh laugh. The laughing gull has a mainly American distribution range living in large part of North and South America, but the regions of the extreme north-west, on one side, and of the extreme south-east on the other. It is present, as vagrant species, also on the Atlantic coasts of Europe and of North Africa; less frequent, but sometimes present, in the Mediterranean Sea. It is vagrant also in Australia and on some islands of the Pacific Ocean and of the Caribbean. 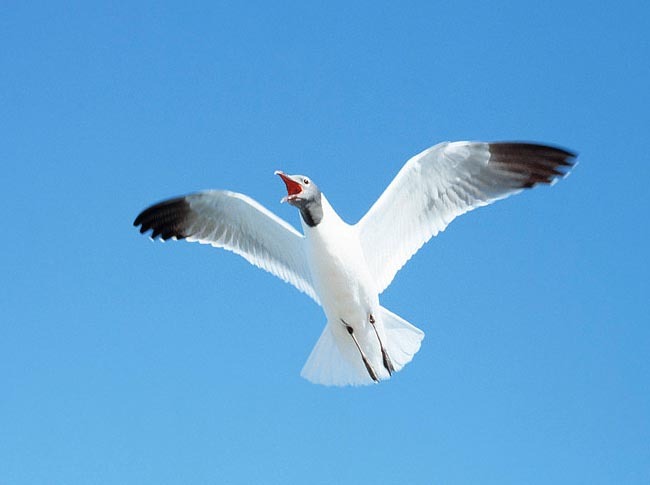 The laughing gull is a species with ample distribution and, during the last decades, its population seems to be expanding. It frequents lakes, rivers and their mouths, reed beds, marshes, swampy areas and, generally, islands but being, like many other gulls, an opportunist species it is easy to sight it while eating even in urban zones where it gets to beg the food to the men. The northernmost populations migrate southwards during the winter, in other zones it behaves as sedentary species. It has a size intermediate between the Mew gull (Larus canus) and the Black-headed gull (Chroicocephalus ridibundus) with a length of about 36-45 cm and a wingspan of about 98-112 cm. The sexes are similar and the livery differs between the summer and winter especially for what concerns the colouration of the head. In summer, this gull has a dark chocolate, almost black hood interesting the whole head from the base of the bill up to the beginning of the neck. The eye, which has brown-black iris, is surrounded by a periocular small border of red skin and presents over and under two periocular lines of white feathers which do not join, neither medially or laterally and which form two white crescents. The dorsal part of the livery (back and almost all rectrices and coverts of the wings) has a nice dark grey colour. The wing has the primary rectrices partially dark-black (under as well as over). The wing, grey, has a white back border ending, towards the tip, in some white small spots present on the dark extremities of the wing. The remainder of the body, from the neck to the belly to the tail, is white. The legs are red-dark brown. The bill, slightly elongated, has a sort of a small ventral protuberance on the lower rhamphotheca at the beginning of the third final. It is red with darker shades at the base and a little before the tip. During the winter, the hood is absent and remains a slight greyish hoarfrost forming two lines not defined at the level of the eye and of the auricular hole. This species may be mistaken with the Franklin’s gull (Leucophaeus pipixcan) which, however, is smaller and more compact, has shorter bill, more reddish legs and the black tips of the wings with a bigger presence of white in respect to the laughing gull; in winter, to the Franklin’s gull remains a sort of a half grey-blackish hood. It can be mistaken also with the immature specimens of Larus fuscus if seen from far away or as isolated individuals. The black-headed gull and the Franklin’s gull have a grey colouration of the back, decidedly darker then the other species of European gulls having a similar size. This colouration resembles that of the Larus fuscus graellsii (Western Europe subspecies). 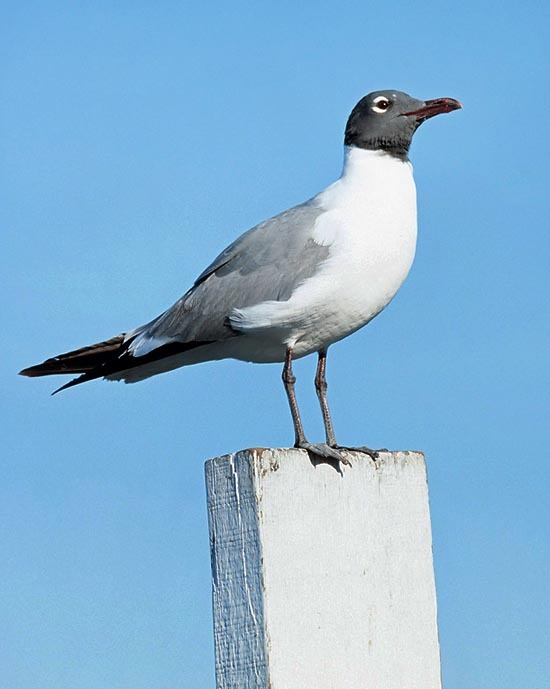 The laughing gull has three classes of age with different phenotypes: the adult already described. The one year old young is greyish with some part brownish, this colouration reaches the neck and the sides. The tail is grey-blackish, especially laterally, and the wing has grey-blackish colouration with slight scales; bill and legs are dark. The young at its second year of life has still greyish neck and some greyish spotting towards the end of the tail. The final livery and the maturity will be reached when three years old. The sexes are similar. It mainly nourishes of aquatic invertebrates, insects and fishes (which it seizes by diving) but has omnivorous habits like most gulls, reaching the point of nourishing of alimentary leftovers and garbage found in anthropized sites. It can have parasitic attitudes and steal the food to other species such as the Brown pelican (Pelecanus occidentalis). Sometimes, it preys eggs and pullets. During the reproductive time, it has coastal habits. For reproducing, it utilizes wet areas, coastal swamps, ponds and rocky islands originating numerous colonies. The nest is rather big and is built on the ground with grass and, generally, with vegetal material. It mostly spawns 3 eggs (2-4) of brown-yellowish-greenish colour decidedly spotted of brown-dark brown which will be incubated, by both parents, for about three weeks or little more (21-23 days). The pullets, which are semi-precocious coming to life with open eyes and able to walk since the first days of life, have a mimetic colouration similar to the eggs being brown yellowish spotted of brown. They are nourished by both parents for about 35 days.